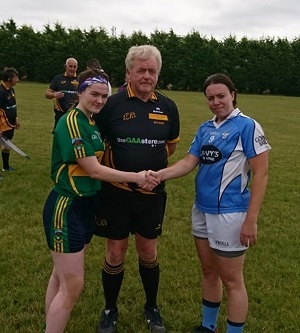 The Ladies Senior and Intermediate Championships continued at the weekend. Geraldines were the big winners in Group A of the Senior competition with a 6-14 to 0-7 victory over Stabannon. In Group B, Cooley came out on top over the Blues, with a narrow away victory; 5-9 to 4-10. Referee Jim Shannon with the captains before the Blues v Cooley game. In the Intermediate Championship Group A, there were good wins for St Pats over Clan na nGael and Naomh Mairtin/Glen Emmets over O’Raghallaighs/Plunketts. In Group B, Glyde got the better of St Fechins, while Mattock continued their recent good form with a win over Naomh Fionnbarra. Full results and group tables are available in our Results Section.